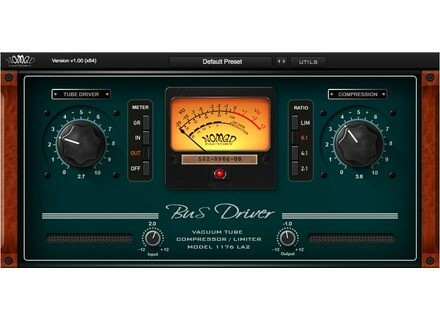 Bus Driver, Software compressor from Nomad Factory. Don't Crack offers for a limited time Nomad Factory's new Bus Driver for free as a tribute to the late Bernie Torelli. A renowned developer, Bernie Torelli recently passed away after a long and strong battle with cancer at the age of 60. He was the founder and main developer of Nomad Factory and had also worked on other projects, including the Plug&Mix VIP Bundle plugins. Two years and a half ago, Don't Crack had launched a special operation to help Torelli and his family face the costs of his treatment, including special prices on Nomad Factory plugins (with 90% of the proceeds going for Torelli) but also a possibility to donate directly through Paypal; to thank their customers for their support to this cause and as a tribute to Torelli, Don't Crack has decided to offer Nomad Factory's brand new Bus Driver for free using code freebusdriver at checkout. A vintage-inspired optical compressor plugin aimed at providing a wide range of compression effects, Bus Driver is announced as "reminiscent of the most renowned compressors made in the ‘60s", and if still necessary the "Model 1176 LA2" mention on the GUI seems to say it all as to the inspirations behind it. Don't Crack has also decided to lower the prices on all Nomad Factory products, with the dual advantage of helping Torelli's family with the unpaid hospital bills and other expenses that have accrued during his illness since the 'fund-raiser', and also helping to the continuation of the Nomad Factory company. More details at Don't Crack's website. Waves discounts three products this Saturday Today only, Waves offers two plug-ins and one bundle at special prices. MIDI Guitar 2 for iOS is out JamOrigin's MIDI Guitar 2 for iOS was just released on the App Store. Livid Instruments to lower prices Livid Instruments has announced a permanent reduction in the prices of its MIDI controllers.